Rafael was diagnosed with muscular dystrophy as a child. Through stem cell treatment, he has seen a slowed disease progression. 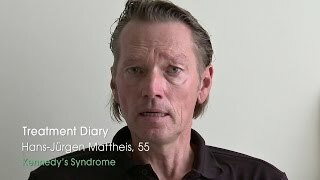 In this video he is undergoing his third comprehensive stem cell treatment procedure at our partner treatment hospital. His daily routines such as holding a glass, eating by himself, kicking a ball, typing on his phone or computer have gotten easier, leading to a better quality of life.